The 2013 growing year was the second dry year in a row for Sonoma County. It was an especially dry spring and warmed up early, so the vines got an early jump on the season. Bloom came along in early May and the temperatures were perfect for berry pollination. The clusters ended up setting an abundance of berries. We had to do quite a bit of cluster thinning to maintain our desired crop levels and to get some sunlight and air movement into the canopy. Harvest came early as well. Fortunately, we had cooler temps about midway through, which slowed down picking and allowed us to catch up on things - including sleep! Harvest was complete after 7-8 weeks.Tasting Notes The 2013 Blue Slide Ridge Pinot Noir has a nose of lilac and lifted blue fruits with dusty essences. 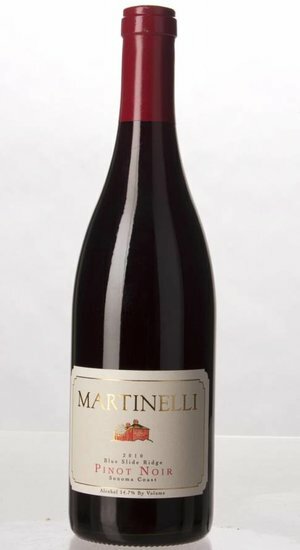 The palate is precise, clean and bright, with dark plum and black cherry flavors.